For those of you who have known me for a long time, you know that I am not much of a cook. I don’t find pleasure in baking a cake or cooking a meal from scratch. However, I do love great food. I love to eat great food….so I basically forced myself to learn how to cook so I could eat yummy food. Living on a boat adds a whole new element to cooking and baking. My powerful propane stove and oven has two temperatures: hot and hotter. I started using cookware that I had never heard of before (what is a pressure cooker anyway?) I even became quite proficient in kneading bread (and even have Capt’n in Training participate). Well one of the most frustrating things about food and boat life is the actual food shopping. If we need to go shopping and we are at a port, I cannot be picky as to where I can purchase my food. I can’t bargain shop, cut coupons, go to my local Trader Joes, etc…I am also limited to the brands that I can buy. As someone who does not like to eat any foods with preservatives, I am sometimes stuck between three options: eat the food with preservatives, don’t eat that particular food, or make my own. Which leads me to day’s blog topic: making pickles. I love dill pickles. But most of the dill pickles in the grocery stores have preservatives. So one day I decided that I would try to make my own. I was pleased at how easy it was to make and how yummy they tasted. The other great thing is that you don’t need any sort of canning equipment, so I was able to make them from the confines of my small boat galley. Now I can’t remember where I put my recipe, so measurements may not be exact – you will have to play around with it. 1/2 teaspoon (maybe more?) of non iodized salt. The only non iodized salt I had on hand was Trader Joes Pink Himalayan Salt. 1. 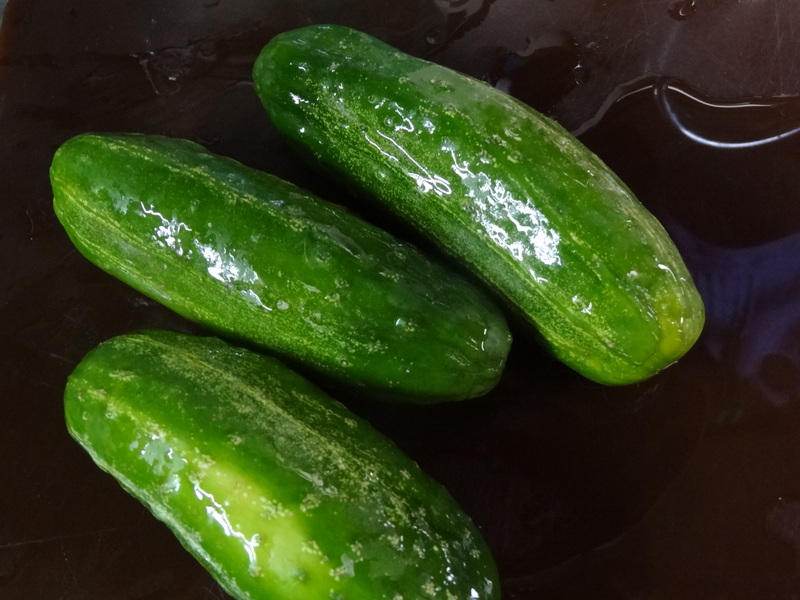 Wash and clean pickling cucumbers. I used three cucumbers and they filled the container I used. Make sure you remove the blemishes if there are any. 2. 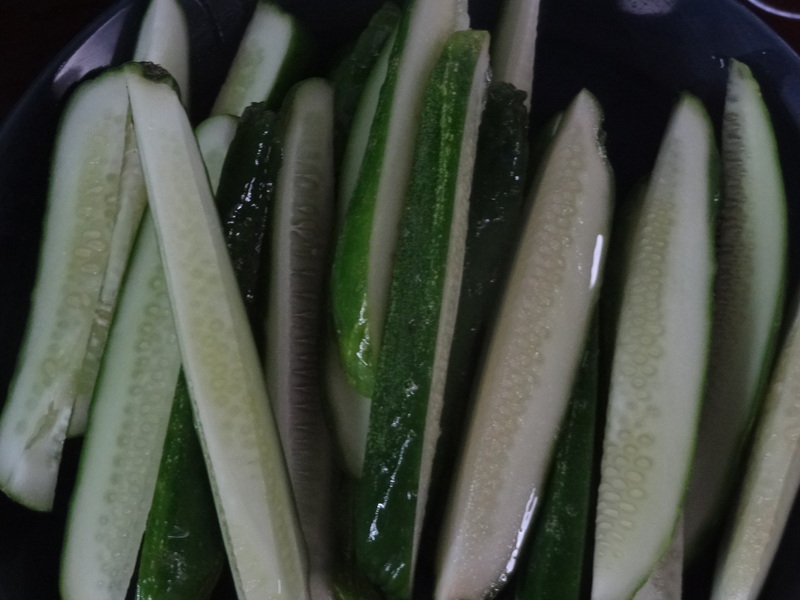 Slice cucumbers however you want. I made spears and had great texture. 3. Boil water and add salt. 4. 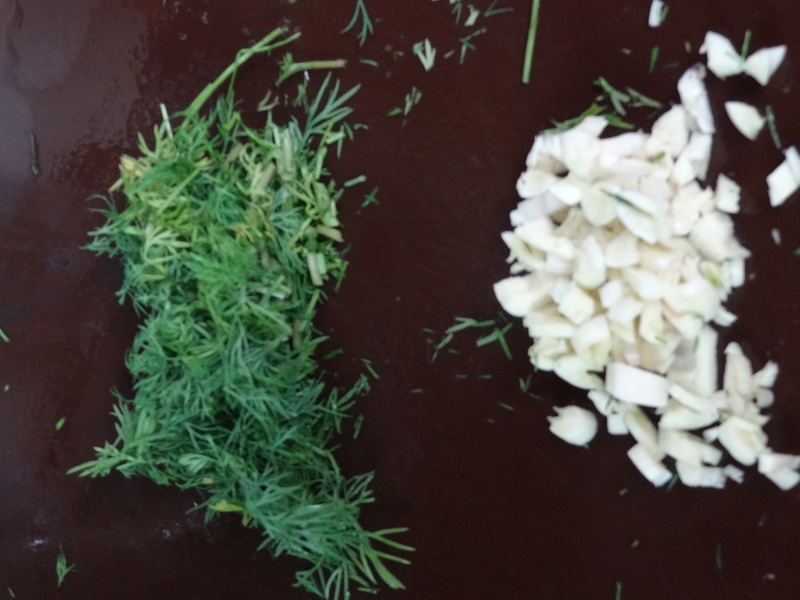 Dice dill and garlic. 5. 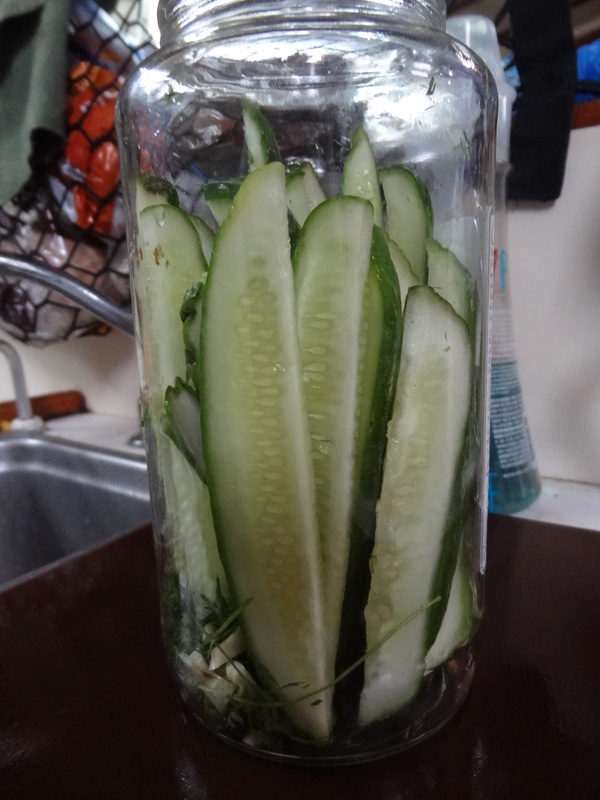 Place cucumbers, garlic, dill (and chili flakes for spice) in your glass jar. After water boiled and has cooled, pour water and salt solution into glass jar. Tighten jar and put in fridge for one week. 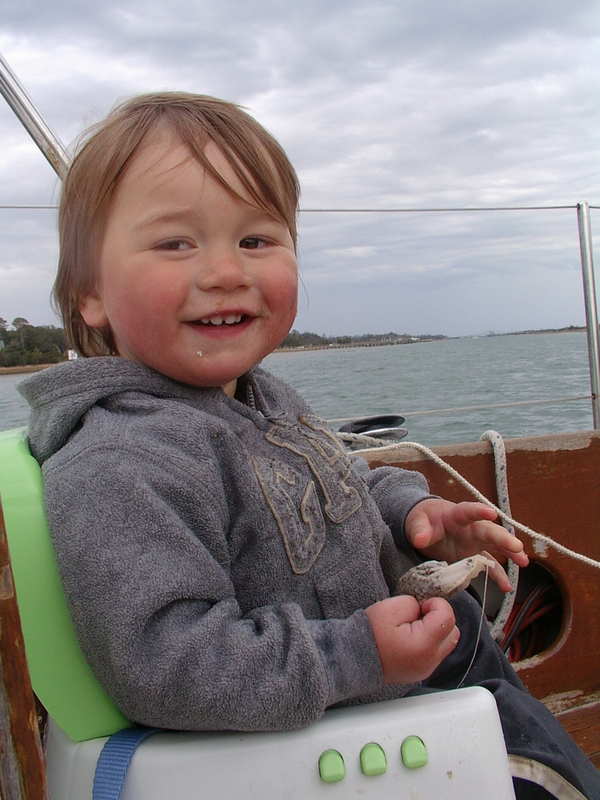 I want to write about how I manage living on a boat while raising a toddler. It is tough enough raising a toddler on land, but then when you bring the boat variable into things; it adds another dimension of parenting. I thought I would first start off with our day to day life on a boat. 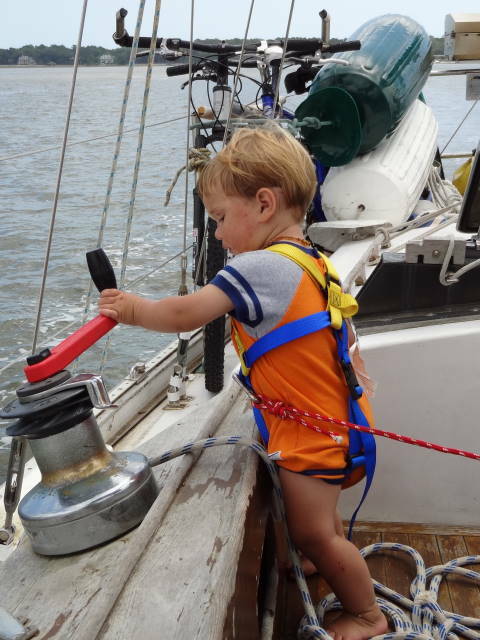 Other topics I will include are: using cloth diapers while sailing, making baby food while sailing, childproofing your boat, and other topics as they come to mind. Daily life on a boat with a toddler is ever changing. It is difficult enough for the adults to have a plan, let alone create some sort of routine for your child. Every time you think you’ve finally settled into some sort of a routine…BAM….something happens and you are back to square one. So for the most part, we have a skeleton of a routine to keep some consistency is Caleb’s life, but we do allow for a lot of flexibility in our day to day life. I would have to say that they days with the most consistency are the days when we are traveling. A typical sailing day looks like this: We wake up, make breakfast, have our quiet time, take the dogs on the dinghy and go to shore for a walk, plan the day’s sail destinations (we have plan A, plan B, and a plan C). Then off we go. 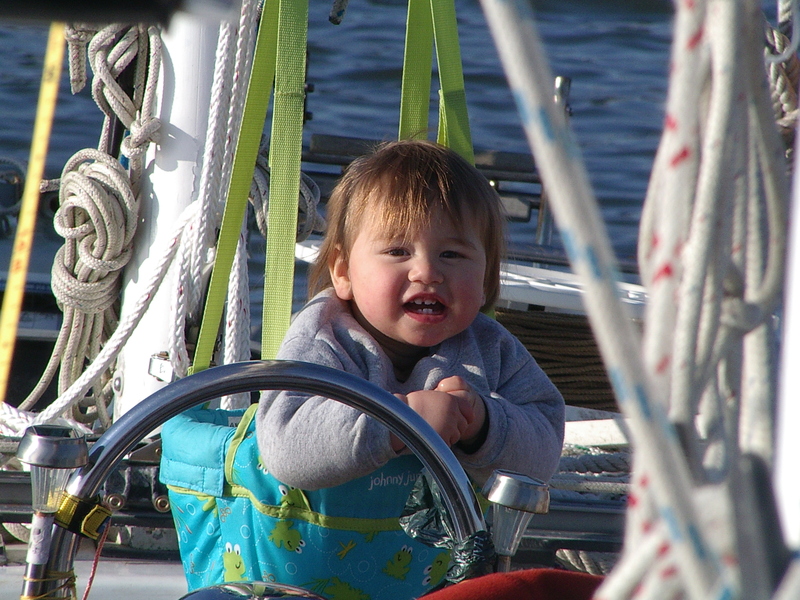 When the weather is nice, Capt’n in Training loves to sit in his booster seat in the cockpit and be a big boy with mommy and daddy while we are sailing. Capt’n in Training is actually quite happy sitting in this booster seat and watching what is going on around him. When he starts to get fidgety, I read to him, I pull out some toys for him to play with, and we do eat yummy snacks as well. When he has grown tired of sitting pretty stationary, we put on his harness and tether him to the cockpit so he can wonder around a little bit. 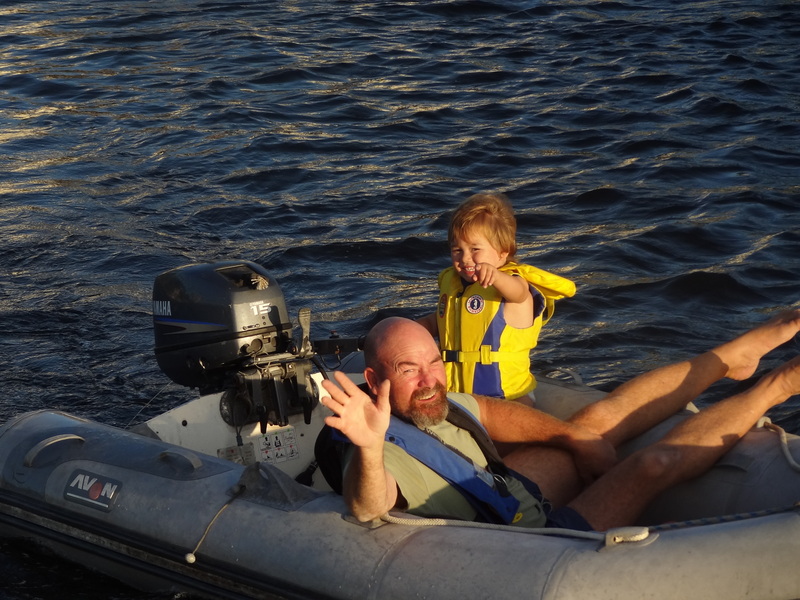 This is when Capt’n in Training loves to sit on daddy’s lap and steer the boat, or just enjoy daddy’s company. By this time, it is lunch, so Capt’n in Training joins me down in the cabin while I prepare lunch. We then eat lunch in the cockpit, and the. It is time for Capt’n in Training ‘s nap. 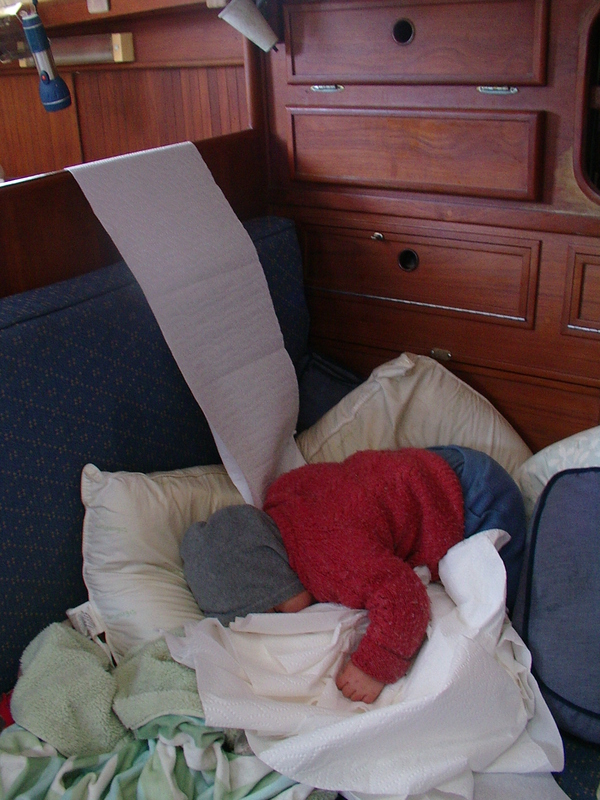 Now I know a lot of people have said that babies sleep a lot on a moving boat, but I am not convinced of this. Capt’n in Training does not seem to sleep longer because we area sailing. He will sleep for about two hours and then he’ll come back up to the cockpit, and by this time we are almost ready to dock or anchor for the night. Remember, we are day sailors and will only sail for about eight hours a day. Once we have anchored or docked, we take the dogs out for a nice long walk, check out our surroundings (remote or not), then come back to the boat for dinner. Evenings consist of reading, playing games, watching movies and going to bed. Of course listening to the weather, planning out our course and looking at the current and tide tables are all included. A bouncing seat is a great item to have on a boat. It doesn’t take up much space and you can hang it really anywhere. Capt’n hung it up on our boom and Capt’n in Training was content while we were changing a light at the top of the mast. However, when we have “settled” into a place for a week, month, or more, the routine is hard to make. I usually do not know how long we will stay in one place. It takes a lot of energy to check out the local children activities and locations and sometimes I do not have the energy to do so. Also, we usually work on boat projects when we are stationary. Sometimes these projects start out as a two hour project and end up being a two day project. Or we have a lovely day trip planned only to get a phone all asking Tim to help out with a pay job, and we never say no to money for the cruising kitty So it is difficult to create a routine for Capt’n in Training. However I try to keep some sort of consistency in our lives, like meal time and nap time. Some days I am okay without a plan. I think that it is good that I am raising a boy who can be flexible and be comfortable in all sorts of situations, and other times it gets really hard and I want some sense of normalcy. So what are things that we do when we are docked at a port for an extensive period of time? Well, we do a lot of playing. And right now Capt’n in Training likes having mommy as a play mate. We also read a LOT of books and do a LOT of bike riding and playground hunting. Playgrounds are actually a great way to meet people. We met some of the best people at the playground. The playground is also where you can ask where the library is, when storytime is, or what special child friendly events may be going on. On the days that Capt’n is not busy working, he takes Capt’n in Training for daily dinghy rides, and takes him fishing. It is in those moments that I am really grateful for this season of our lives in which daddy and Capt’n in Training have these great experiences together. One of my greatest concerns with living on a boat with a toddler is the limited social interaction he has with kids his own age. So to encourage playing with other kids, when we are in towns or cities I always take advantage of the library. We visit the library weekly and participate in age appropriate activities when available. So that is basically our day to day life. 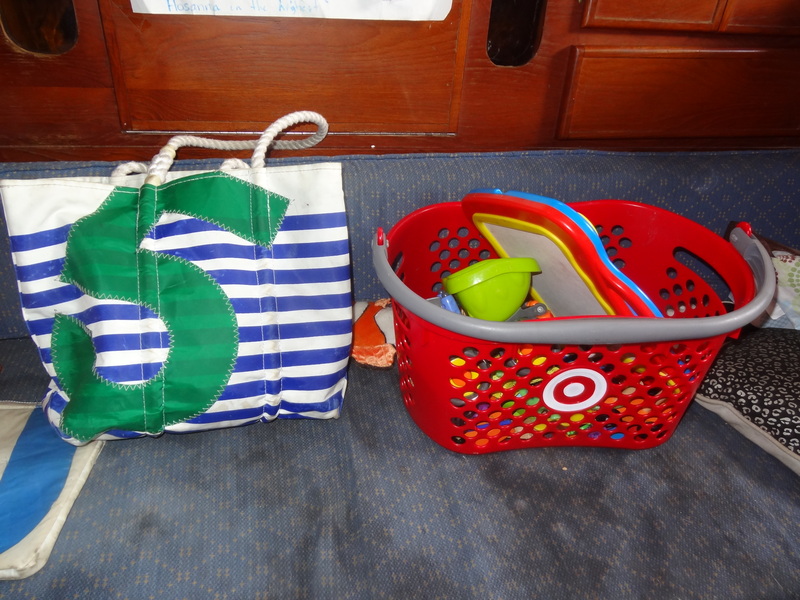 Now, I mentioned that we do a lot of playing and reading on the boat – well where do we put all this “stuff” on a boat. We don’t have a designated play room that many homes have. No, we have the “everything room.” It is the space where we eat, where we read, where we watch movies, where we email, and where we play. It is about 10’ x 10’. I laugh as I write that because it really is a small space, but it serves us just fine. 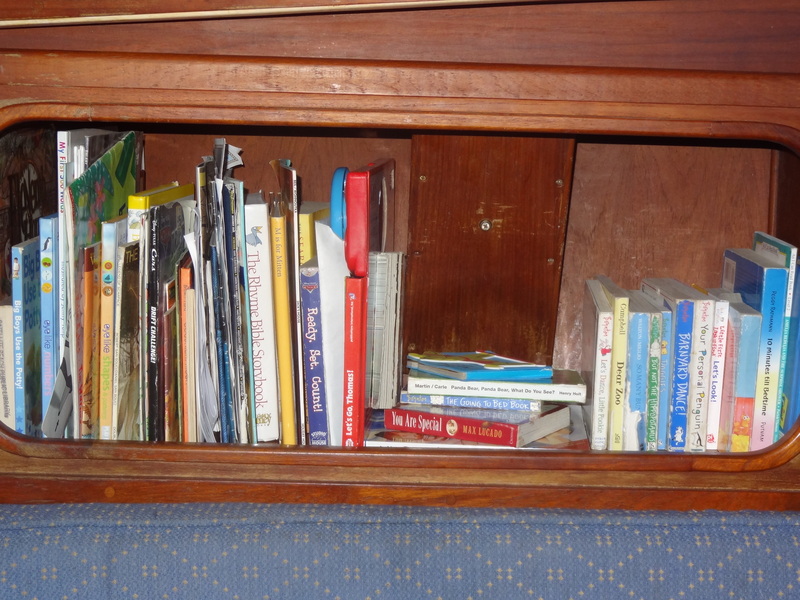 We use the main bookshelf for Capt’n in Training’s books so he can access them any time he wants. He is particular and will pick out certain books for me to read. We modified our table storage as a play chest. I remember when we bought the boat I was excited that the table had some storage for wine and glasses and plates. Then I remember about two months into our sailing trip Capt’n in Training managed to figure out how to open the table storage and remove the wine glasses. 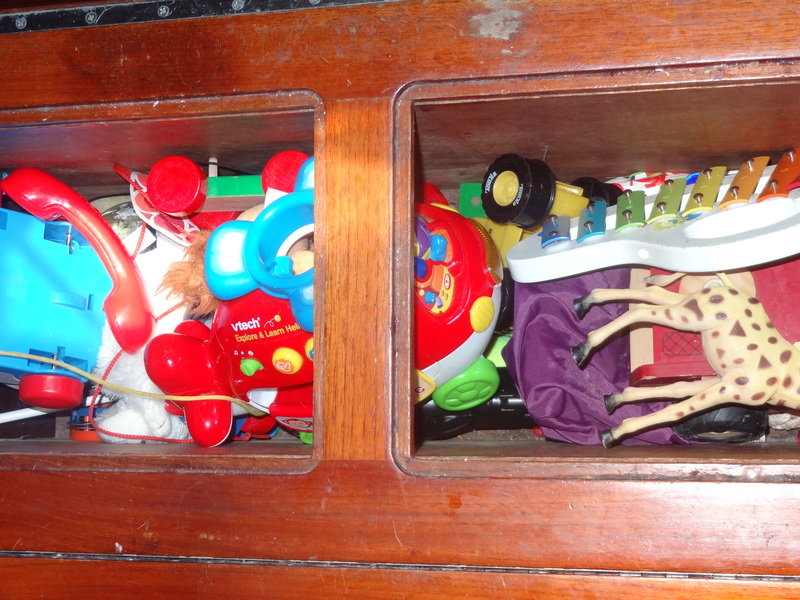 The next day that storage space became Capt’n in Training’s toy chest. Two other ways I store toys are: I store toys in the grocery store’s hand held baskets, and extra bags I have lying around the boat. My favorite is my seabag (http://www.seabags.com/) made from old sails. I also want to make it very clear that I do not think every day with Capt’n in Training is a walk in the park. Oh no, just like with any child, we have a good days and our bad days. Below is a picture of one of our bad days. We were ocean sailing off the coast of Connecticut and it was cold. I had to help Capt’n with something on deck so Capt’n in Training was in the salon. Well he wasn’t happy and he cried and cried and cried. When I had the free moment to check on him I found him asleep on a roll of paper towels that he unraveled. (We have since moved the paper towel dispenser). I think we could all use something silly and lighthearted today. I saw a fellow liveaboard friend at church on Sunday walking around fellowship hall with her iPad and cell phone, with chargers, looking for an outlet to charge her electronics. I approached her and jokingly said, “You know you live on a boat when…..you bring all your electronic devices and chargers to shore and charge them.” We both chuckled and came up with a couple of other, “you know you live on a boat when…” and I said this would be a great Friday top five! You know you live on a boat when…. You are on shore and proceed to use every single restroom you see to enjoy the comfort of pressure running water and an automatic flush! You are invited to go over to a friend’s house and proceed to bring your laundry along with a dish to share…after all, you don’t know when is the next time you will be able to do laundry! You bring all of your electronic devices with chargers and charge them every time to go to shore, whether it is at a friend’s house, restaurant, church! You are in a restroom on shore and you look for the instructions to flush the head. Each boat has its own specific way of flushing and many have instructions posted in the head. That’s all. Short and sweet. Happy Friday. Hope it is looking more like Spring every day where you live. Boston will not be shaken by the Marathon bombings. As I heard and watched the horrific events of the Boston Marathon bombing on Monday April 15, 2013 from our boat in Cocoa Florida, I was overcome with many emotions. Firstly, scared and worried about my many friends who were either running the race or watching the race from the sidelines. Secondly, confused as to why anyone would do such a horrific thing. Unfortunately, this of course is not the first senseless act of violence, and I daresay it will not be the last. Thirdly, pride of my home city, Boston. I am not surprised at all at the amazing job by the first responders. The way they attended to the injured and hurt and managed the chaos that surrounded them is something none should take for granted. In addition, there are new stories coming up on the news and social media sites about marathon runners helping others in need. It seemed almost immediately after the bombings, towns were sponsoring candlelight vigils, and support groups for the injured were formed. I know many people have already said this, but it is awesome to see how this tragic event has not shaken the resilient city of Boston. In fact, it has brought people closer together to work in unity. This event has also hit close to home since a few individuals from my hometown, Stoneham, were seriously injured in one of the bombs. Brothers JP and Paul Norden, and Mark Fucarile each lost a limb and have serious burns as a result of Monday’s attacks. To help, donations can be sent to Stoneham Bank, 80 Montvale Ave, Stoneham, MA 02180. Checks can be made out to Stoneham Marathon Victim Fund so the money donated will be shared by all 6 victims of Stoneham.